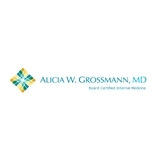 Alicia Grossmann, MD (Austin) - Book Appointment Online! I have had really bad luck with doctors, but she was excellent! She saw me right away, was easy to talk to, and actually listened to me rather than just hearing me. She went slow so I understood everything, and she made everything as comfortable and efficient as possible. I definitely recommend her as a primary care doctor!